Anne Ransom is a 21 year-old model who resides in Seekonk, Massachusetts. 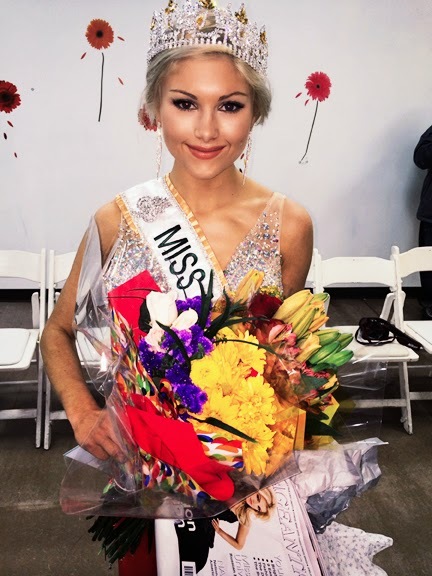 She is the current Miss Massachusetts U.S. International 2014 and will compete in the Miss U.S.International 2014 pageant in Orlando, Florida on June 27. Anne is a member of Rhode Island's branch of Project Heal, which is a non-profit organization that raises awareness for young people suffering from eating disorders, and she has recently joined the board of chairmen for the Rhode Island SPCA, where she will educate young people on the importance of treating animals with love and respect. Besides volunteering with various organizations and charities, her hobbies include weight lifting, reading motivational books, singing, traveling, modeling, studying nutrition and health, watching movies, and creating vision boards. If you were to come back in the next life as an animal, what would you be and why? elephants are so wise and so huge! They are amusing, people love them, they give rides to people, and they're just a lot of fun! They are gentle giants, and I'd love to be a gentle giant! Red! I love red because it's passionate, it's fiery, it's spicy! Kinda like me! I actually got involved in pageants through charity work. It sounds really funny, but I had been doing so many years of volunteer work that finally someone told me, "You know, Anne, have you actually considered pageants?" I didn't really think much of it until I researched and realized that it's such a positive network for meeting other young women who love charity work and helping out with their community as much as I do. Would you advise your younger sister to compete in pageants? Why or why not? I would definitely advise my younger sister to compete in pageants because they bring out confidence in young women, help cultivate their inner and outer beauty, give them many opportunities to reach out to the community and to prepare them for their life ahead. What would you never do to the person you love? First of all, I would never betray the person that I love. I believe in honesty and being true to someone. I also would never go behind someone's back and lie to them. I definitely would say that I am very nerdy. I'm a big karate, horseback-riding, TV geek. I'm very genuine; I'd do anything to help someone out. And I'm also humble; I believe in showing that you are proud of yourself but not too much. Name three of your pet peeves. One of my pet peeves would be rude people. I don't see any sense in being mean; I'm a very nice person myself and I like nice people. I don't like lying; I'm an honest person and that's how I was raised - to be honest person. And fighting: I am not a confrontational person and I believe in being nice and kind to others. Name two people who inspire you. Two inspire who inspire me would be my grandmother who is the hardest worker I know. She takes care of our whole family, she provides for us and she always has a spiritual, positive attitude. I would also say that my father inspires me. He is also someone who has worked very hard his whole life to provide for us and I believe that through hard work you shape your life and the people's lives around you as well. When I look in the mirror, I see a strong young woman who has overcome lots of obstacles to get where she is today. I also see someone who is incredibly positive and who would do anything to help out someone. I see someone who is beautiful not only on the outside but in the inside as well, and that's very important to me. Why do you want to be Miss U.S. International 2014? I would love to have the opportunity to be Miss U.S. International 2014 because I believe I possess the qualities of Miss U.S. International should have. I'm not only strong both mentally and physically, I also care about people and I want to raise awareness of the charities that I believe in and support, and I can be a wonderful role model for many young women and men out there. I think I can give my heart and soul to be Miss U.S. International and to be an excellent representative of the country at Miss International. Should you win Miss U.S. International 2014, what will be the first thing you will do? If I am lucky enough to win Miss U.S. International 2014, the first thing I will do is to eat a big piece of cake, celebrate with my family, and promote my favorite charities! and follow Anne on her journey to Miss U.S. International 2014 pageant!